When it comes to elaborate schemes to defraud people, only few go as far as this father-son duo from Delhi went. The two fraudsters dupe people on the pretext of selling products to NASA and DRDO. According to reports, they even dress their part as space scientists. 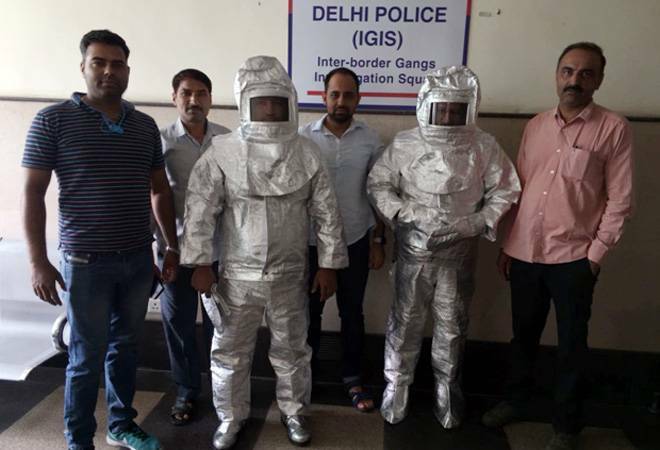 The Crime Branch of Delhi Police nabbed Virender Mohan Brar (56) and son Nitin Mohan Brar (30) who defrauded a victim, Narendra, on the pretext of a product called Rice Puller (RP) that space agencies were apparently willing to purchase for Rs 37,500 crore after testing its genuineness. Narendra had already ‘invested’ Rs 1.43 crore to facilitate the genuineness test that would enable the sale eventually. It all started three years ago, when Narendra came in contact with an individual who explained the huge profits that were to be gained by investing in the RP, which was apparently required by the likes of NASA and DRDO, no less. In April 2015, Narendra received a call from a businessman who wanted to sale RP. Narendra then approached the individual who told him about RP and its lucrative avenues. After a few call forwards, a meeting was arranged between Narendra and Virender Brar who introduced himself as the MD of a company, M/S Rehan Metals that’s based in USA with an office in Moti Nagar as well. Brar told Narendra that their company could arrange for the sale of RP to these organizations for Rs 37,500 crore per M/A once he buys the RP. The sale to these space organizations would happen after a genuineness testing by NASA and DRDO scientists that Narendra would have to fund. Brar also told Narendra that the scientists would give them Rs 10 crore immediately on the spot if the test went well. Narendra ended up paying them lakhs of rupees in installments after entering into an MoU with Virender Brar. He paid Rs 5.6 lakh, 19 lakh, Rs 24.6 lakh and Rs 38 lakh to arrange for the test, including anti-radiation suits, scientists’ fee and chemicals that were required for the test. The testing of the RP was eventually scheduled in UP’s Hapur but was cancelled because apparently the place was not conducive to the test, following which the testing was cancelled for a couple of times more. At the same time, other associates pressurized Narendra to finalize the deal or they would sell the RP to another buyer. Narendra was then introduced by an associate to another company, M/S Stars World Heritage based in East of Kailash, for a new deal on the RP and was assured that he would not be cheated. He again entered into an MoU and paid Rs 5.6 lakh, Rs 3.5 lakh and Rs 42 lakh for the same stuff he had paid earlier. This time the testing was scheduled in Himachal’s Dhramshala and was eventually called off because the sky was not clear. Eventually when Narendra, who owns a garment business in Delhi, realized that even the scientists hired by the companies were fraud and were working on a salary of Rs 20,000, he complained to the police. RP or Rice Puller does not exist. It is a device made up by the fraudsters to fool potential victims. They take a copper plate or utensil and coat it with liquid magnet. They fill the utensil with boiled rice with small iron wires and fool people by pulling the rice towards the magnet-coated plate. They also say that the object is a rare piece of copper that has been struck by thunderbolt in the hills of Uttarakhand thereby giving it ‘powers’ to pull the rice. It is much sought after by space agencies for advanced space research. The cheats tell their victims that the RP will be purchased by NASA/DRDO for thousands of crores but the organizations will test it before purchasing. They ask the victims to fund the testing that their company would arrange. Once the complaint was lodged, the police arrested the Brar duo who deals in antique/rare metals. During the investigation, the RP copper plate, alleged anti-radiation suits, alleged anti-radiation chemical stickers were recovered from the accused along with laptop, printer, blank letter heads of Rehan Metals, cheque books, fake IDs and an Audi car. Brar does not only deal with fake NASA equipments, he has a rather strong portfolio that includes objects like magic mirror, two-headed snakes, Naagmani and the like.